From InfoWars to Presidential Advisor? 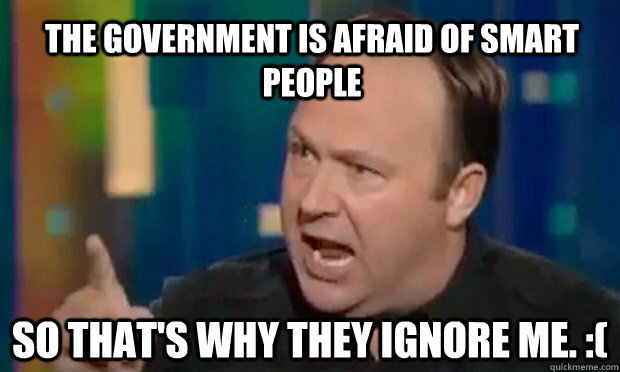 10 Hilarious Alex Jones Memes You Need to See! From InfoWars to Presidential Advisor? 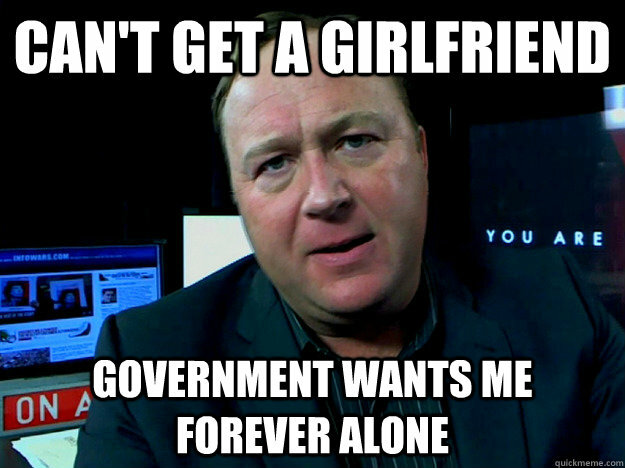 9 Hilarious Alex Jones Memes You Need to See! 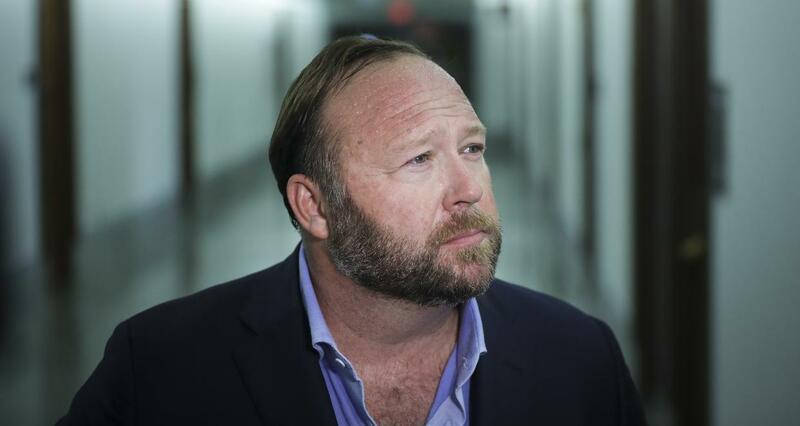 Alex Jones rose to prominence through his web site, InfoWars and his radio broadcast, The Alex Jones Show, where he has propagated “Fake News.” The noted conspiracy theorist is a famous supporter of President Trump, but his best accomplishment is supplying meme specialists with an ocean of content. The Trump administration is only a month old and the new additions to the cabinet have been quite divisive. But perhaps, nothing can be more daunting than the latest speculation about President Trump’s ardent supporter, Alex Jones. 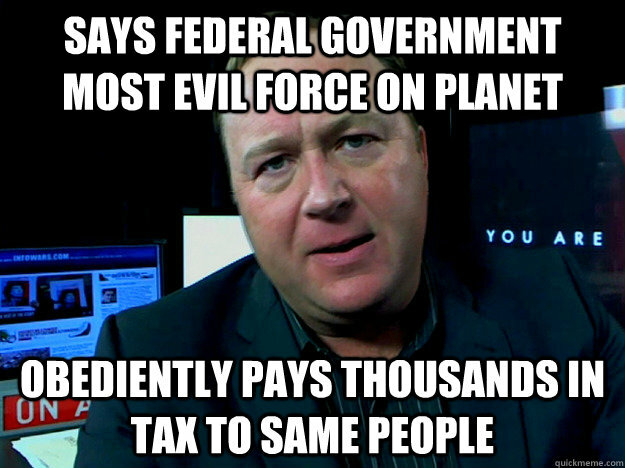 Who is Alex Jones? The conspiracy theorist is reportedly taking on the role of “occasional information source and validator for the President of the United States.” Jones also chats with the new POTUS on the phone regularly. 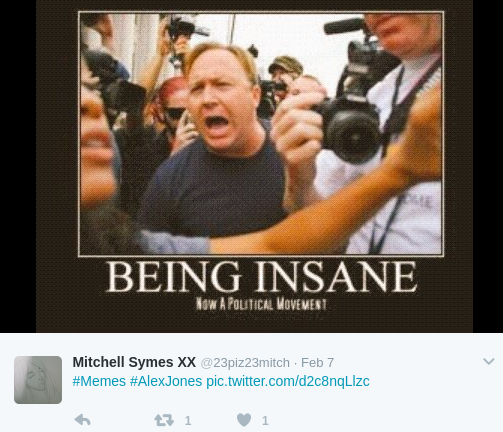 Through InfoWars and The Alex Jones Show, Jones has promoted conspiracies inconceivable to the most imaginative of minds. From Satanist Lady Gaga and Bill Gates being on a mass eugenics mission, there’s nothing Jones hasn’t spared in his theories. This is aside from his moments of crazy behavior, like yelling at BBC’s Andrew Neil. His erratic conduct has made him the subject of some of the best memes. So, if you’re looking for some laughter, these Alex Jones memes are perfect. #1. People have to stop picking on young Barron Trump. 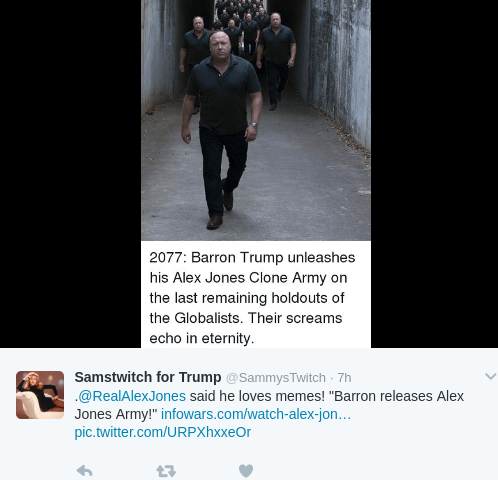 But this meme on the First Son’s personal Alex Jones army is rib-tickling. #2. Wait! Hasn’t that always been a qualifying criteria for politics? #3. 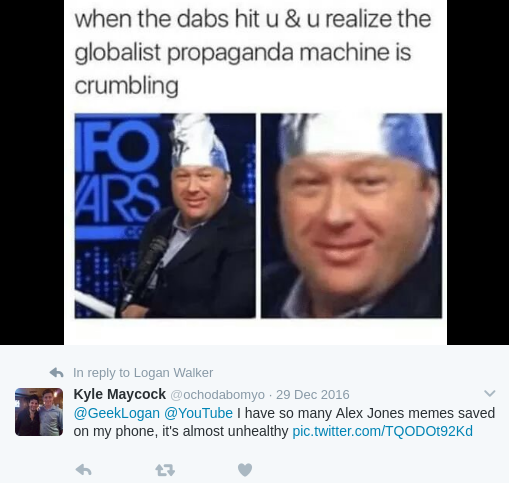 Combining the Alex Jones meme trend with dabbing and it’s a meme explosion. #4. There’s a conspiracy…err…answer to every problem. #5. Conspiracies pay well…at least he performs his duties as a responsible citizen! #6. 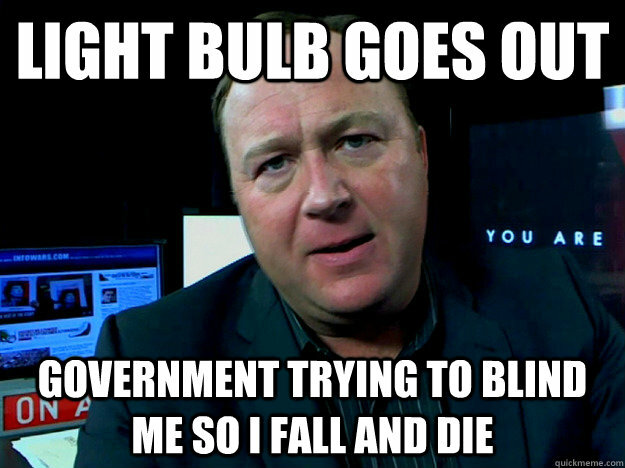 How many conspiracy theorists does it take to change a light bulb? None! They won’t give in to the bulb manufacturer’s conspiracy. #7. When the hunter becomes the hunted! #8. Alex Jones merchandise advertising campaigns are conspiring against Alex Jones merchandise. 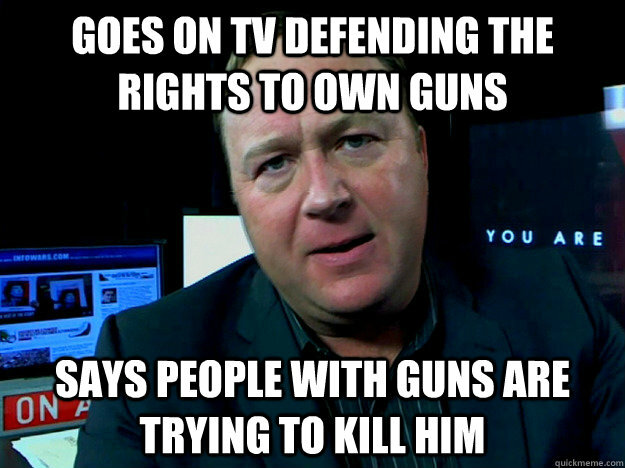 Your daily reminder that Alex Jones is an idiot.